Huge post with a lot of important information, please take this storm seriously and begin your preparations today! Blizzard conditions are looking more likely across the Palmer Divide and Northeastern Colorado. Strong winds approaching 50mph will cause blowing and drifting snow as well as whiteout conditions. Travel will be dangerous. Most concerned about Palmer Divide areas East of Castle Rock and Northeastern Colorado. If you must travel, please have a winter survival kit… I’ll post it again for reference. 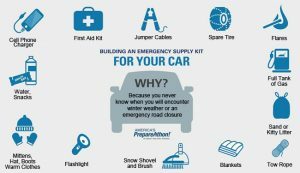 By the way, it’s always a great idea to have these items in your car when you need to be out driving in snow. As we know in Colorado a minor storm can turn into a major one very quickly, so be prepared! Please stay aware of the forecast, significant uncertainty still exists on whether this will be a high or low impact event. We are urging folks to be prepared in case it does pan out to be a high impact event. There is still a lot of model disagreement between the North American models and the Euro. The NA models still show a storm track further north and at a quicker pace, this is why NWS has waited so long to see what this storm actually does. It’s easy to count this storm out with so many models calling it a bust for the front range of Colorado, but the problem is the Euro still takes the storm track South and slows it down a bit. The Euro has been by and far, much more accurate than our own U.S. based models for several years now. While it still has the ocassional curve ball it misses (the last surprise storm) it doesn’t happen very often. 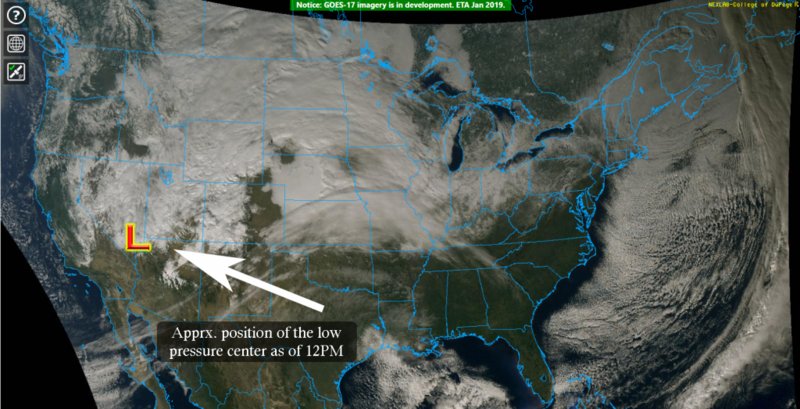 The image above shows the approximate location of the low pressure center… the thing is it is a bit further South than many of the North American models were predicting. This southerly bias is what caused NWS to pull the trigger and issue warnings today. Now, could the storm still fall apart? Absolutely, but given we’d want a more southern track for a higher impact event and that’s exactly what we are seeing (so far) it seems like a good idea to at least get people prepared. The next steps are to continue to watch this storm, if it wobbles any further North as it crosses Utah and the Colorado mountains we’d expect to see lesser impacts from this storm for Colorado’s front range. If it stays on track and biases more Southerly, we will be in business! By the way, main part of a Blizzard warning is not how much snow we get, but the combination of snow (really any amount that can cause travel issues) and strong winds. 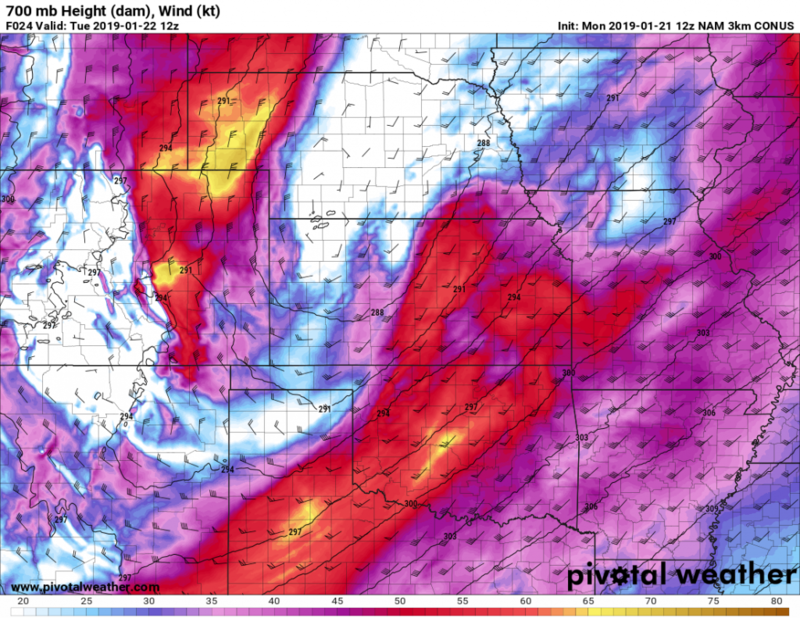 700mb winds will either be at surface or a bit above depending on your elevation but models have them absolutely screaming early Tuesday morning into about mid morning. Those red areas are up to 50mph so be aware blowing and drifting snow will be very likely with this storm. That’s it for now, will be keeping an eye on it all day Monday, into Monday night and Tuesday morning. We will be sure to pass along any additional updates. School closures for Douglas County? John – nice job on the Monument forecast. It was hard to measure with all the wind but I believe somewhere between 7 and 9 inches fell at my house on the west side of Monument. We live in south Parker and enjoy your weather forecast! Thanks! !